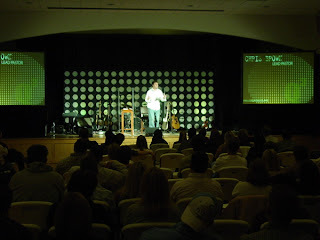 During our core days of Ridge Church we did a series called "Interrupted." The big idea being the fact that interruptions in our lives are inevitable and often un-invited. However, some of the greatest interruptions have the capacity to become blessings and opportunities. Children are a great example. They interrupt everything--the quiet, our checking account, the new furniture smell that 'was' in our homes, our date nights and romantic meals, our emotional stability:-) But you'd be hard pressed to find a mom or dad that doesn't talk affectionately and often about their children. Interruption? --Yes!... Blessing?---Most definitely! My favorite time in the series was the night we discussed "The Safe Life Interrupted." Maybe you can relate--- it is a struggle in my own life not to simply migrate back to all that is safe, convenient and predictable. Most of us like a measure of predictability and routine. BUT, truthfully, as I consider my personal experience pursuing Jesus and living out the values he taught, it isn't always simple or safe or predictable, but it is always satisfying. To put it lightly, thi s idea stirred again in my mind today reading Chazown, by Craig Groeschel. It wasn't even his main point in the chapter I was reading, but he threw out this rough definition of "Sacrifice" that resonated and stuck with me. It went like this: "Sacrifice is giving up something you love for something you love more." Simply profound, huh? I can't help but think what this would look like in my life. I mean what if?...What if we actually did that consistently? And what if the something we loved more was actually someone?...and what if that someone was actually worthy of the sacrifice? Many of us have discovered that "someone" in Jesus, but I still think He is the best kept secret around. But, I'm getting off subject... Bottom line, following Jesus isn't our safest option necessarily but it is the most sensible and satisfying one! It is the only option that can make sense of this life. So don't live a bubble wrapped life. You've got to dig into this thing and discover the depth of life available in Jesus. I'm convinced every one would love Jesus if they would just let down their guard and meet Him! Check out the video that went along with "the safe life interrupted" talk. I think you'll enjoy it. I'd love to hear your thoughts on "sacrifice" as Craig defined it--how did you process it? and the video! Who's 13th you say? Ridge Church of course. Not 13 years, or even 13 months, but 13 services. We fully intend to have many more of these! We began the journey that first night by talking about the fact that the way things are in our world, in our lives, in the church, is not the way they have to be. (Listen Here) We truly believe that there is something incredible that happens when the church creates contagious, relevant environments, where peole can be encouraged to pursue the right kind of relationships---starting with our relationship to our Heavenly Father. I love the challenge of looking ahead and wrestling through the details of the future of this church. God wired me that way. The preeminent question that we are asking currently is when, where and how we will make the move to becoming a Sunday morning church. Why? It is simple--because we believe this is the optimal time to meet---the best time to partner with each of you to become an "easy invite" for your friends, neighbors, and co-workers---especially for families with small children, and we have alot of those! PLEASE hear my heart: Our mission is about people, not facilities, buildings or private empires, BUT if a facility (specifically one available on Sunday morning) better enables, and platforms us to partner with each of you in seeing the people in your world and mine meet Jesus, then it isn't "a nice to have--it's a must have!" S0...some of you love this idea. It resonates with you. It makes sense to you. Many of you have been impacted, and influenced personally! Many of you ask about the progress and how you can help so here it is: Become a vision partner with Ridge Church. Cool stuff is shaking loose and many have already stepped up, but we need at least 12 more families, or households, or individuals (you too college students!) that would partner with us as "percentage givers" this next year at Ridge. (Percentage Giver meaning a commitment to give a percentage of your normal income)" If we have 12 more commitments we will make an offer on an incredible Sunday morning facility. Exciting Days! You can help. Click here to sign up as a Vision Partner. Well, good luck finding bread and milk today, around Charlotte. I've never understood it, but apparently those two items are essential to survival in case you get snowed in for a week (with less than two inches of snow)? So, less than 24 hours later the snow is gone an d y ou can probably find discounted bread and milk on craig's list or ebay or something. But, not all of the snow is technically gone. We have the largest snow man in the neigborhood. A little bit weird shape, but he is stellar! NOTE: It took all of the snow in the front yard to make him. We were playing in the snow at 8am this morning, and then the kids were off to school after a two hour delay. They loved it! The night ended with community group at our house. We do some pretty cool stuff at Ridge Church, but community groups are clearly the best and most vital thing that we do. We have seven couples in our group that hardly knew each other when we began. In fact, most of them had never even met prior to group but friendships grow so quickly in this context. We are having an incredible time together. My wife is a killer cook, so the food is always great, but it is so fun to watch these groups take off and grow together. Next weekend we are doing a retreat in the mountains and every one is stoked, looking forward to spending the time together. Tonight after group I told my wife that I can't wait until these groups are meeting in neighborhoods across the city. Every person deserves and needs to experience relationships in this kind of context. Every person needs a group of people to do life with. February 2nd we are having our first "Group Link" to form new groups. Seriously you need to sign up and attend if you haven't already. You won't regret it. The topic of many sermons in recent years... "If Jesus decided to avail himself in our current world what would he look like" Well, for a moment we thought we had spotted him in the Ridge Church parking lot. 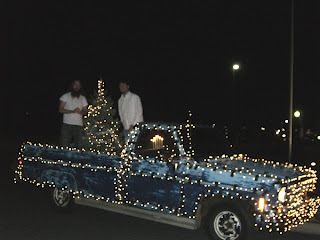 He was rollin' in this "pimp my ride addition" pick-up truck approximately 1,700 lights, including blue lights around each tire, and a tree in the back. Well, no Jesus, not yet anyway...but it was a cool reunion with a Brian Queen. I didn't recognize him at first, but I used to speak at Garinger, his high school like 7-8 years ago. Good to re-connect Brian---love the ride! Keep pursuing Jesus. 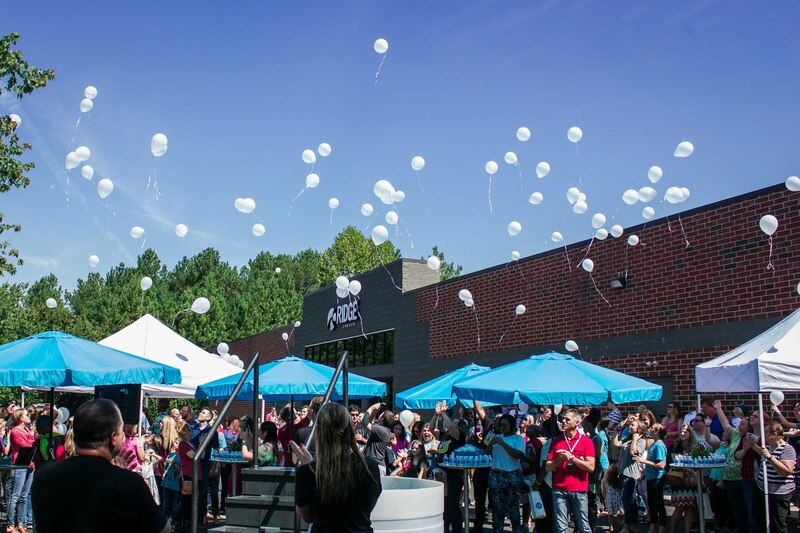 Ridge Church had her 13th public service this past weekend and we have a really cool sense of momentum right now. 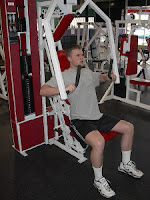 Tons of new faces, and people are really excited abou t gro up link and are signing up to attend (February 2nd). Many of the people that have been to Ridge Church only three or four times are already shadowing in various ministries and jumping in to give and serve. Andy Stanley talked about the need that every person has "to be known" We all live with the tension of image management and run the risk of living our lives never really being known if we don't allow ourselves to be in relationship with the right people. It's an unbelievable talk. Check it out (Q3 part two). We have a lot people make comments about the high quality that we have been able to pull off as a brand new "load-in" church. Honestly we still feel like we are just learning, and doing the best we can with what we have, but we do strive for excellence. Excellence is not one of our core values but creating relevant environments is. We want to create environments that partner with Believers as a safe place for them to invite the people in their circles of influence that have yet to discover the love, acceptance, and Salvation found in Jesus. We talk alot about the fact that everything that we do communicates something that we believe about God. This excellence shows up in a significant way in our music. 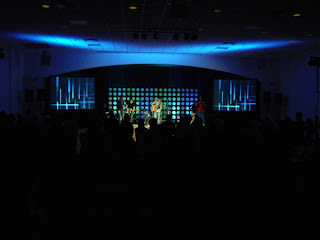 We are privileged to h ave a lot of amazing m usicians, that are in love with Jesus, play on the stage at Ridge Church. 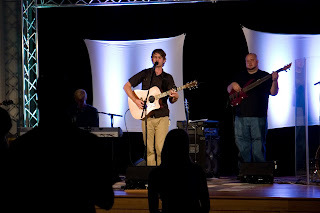 Josh Via is is a good friend and amazing musician that loves Jesus with all his heart. He leads for us frequently and we love this guy! Ben Richter has knocked it out of the park for us a few times too and will lead for us regularly in 2008. And Michael Johnston has lead for us as well. Quick story on Michael, in response to questions from several of you. 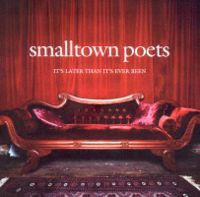 He was the lead singer of a really poplular band a few years ago called the "Small Town Poets." Michael obviously has an amazing level of talent but carries himself with humility--never like a rock star. Check these guys out on-line, then come out and hear them in person at Ridge Church. OKAY. 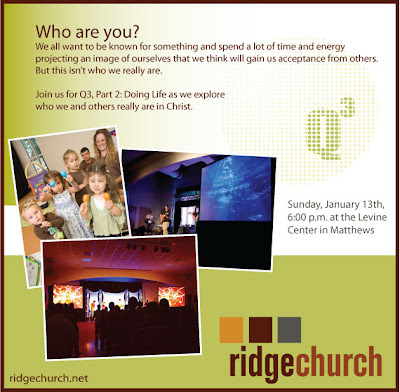 The burning question...the number one question I'm asked currently is about Ridge Church moving to Sunday Mornings. When? and Where? We are in pursuit of several Sunday morning opportunities and you can help us get there. If you'd like to know more click here to find out about becoming a Vision Partner with us. For those already involved, we are about 12 commitments away from our goal. Thanks for your interest, and thanks for partnering with us in this amazing vision!! 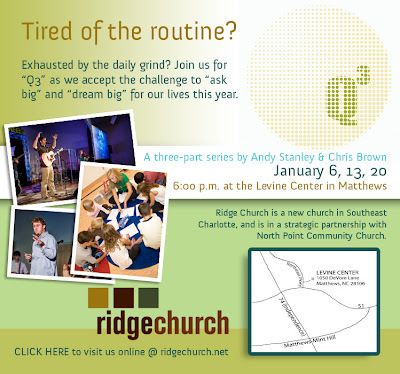 Ridge Church kicked off the new year with a series called "Q3". The first night was about Asking Big, something all of us could probably afford to do a little bit more of. It is pretty normal for us to drift toward safety and toward prayers that manage the details and circumstances surrounding our lives, but there is so much more to prayer. Most of the time when pastors talk about stuff like this there is some sort of hidden agenda for the church, but the topic of the night was all about individuals asking God to do big things in their personal lives. Stuff so big that "if it was answered it would drive people in our lives to acknowledge the hugeness, the power, the love, the hope, the compassion, the ability of our God! If each of us would take this challenge seriously I think the results in our neighborhoods, families, places of employment, highschool and colleges would begin to morph before our eyes. I can't wait to see it implemented in our lives!! Ask Big. Sunday was a great day for many reasons. New faces, people beginning to fully embrace this church, great volunteers displaying excellence in every way, incredible music and worship. We talk a lot about the fact that every week someone is experiencing Ridge Church for the first time. This reminder is a vital part of our preparations. 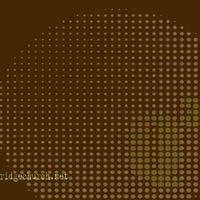 Check out this blog entry someone forwarded me from a first timer at Ridge. Sunday night church is risky business though. Seriously, who in the world goes to church on Sunday night? It is a stretch even for people that like church! Especially if you have small children that go to bed early. Inspite of that we had 50 children fifth grade and younger at Ridge Church. There was a contagious energy in the building, and very little space in the parking lot! Churches don't typically grow numerically on Sunday nights. In fact most decline, so we are grateful to God for the increase at Ridge Church. Something is about to shake loose! Ridge Church took a year in '06 to cast vision, train and develop a core team, and launched to the public in September '07. We now have 12 public services under our belt and feel like the next big step is making the move to Sunday mornings. Many of you are interested in helping us get there! If you'd like to help, here is one simple and practical way. We are asking 45 people (housholds) to partner with us as "percentage givers" at Ridge Church this next year. This would enable us to make an offer on a Sunday Morning facility in Matthews. Help us get there!! Become a "Vision Partner". (This link is not a public link on our website) Join the journey, the adventure, something amazing that God is up to in this city.